Kay K. hasn’t received any reviews just yet. 1. Kay was on time. 2. I provided all materials - Kay used what she needed and there was no evidence of wasted tiles beyond offcuts. 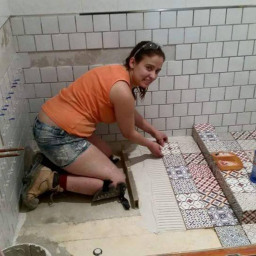 To put this into perspective, the guy that did my floor used 30m2 of tiles for a 25m2 floor - all so he could try to charge me more based on tiles used as opposed to floor space. 3. Work area was left spotless. Lift and replace floor tile. Maddi O. said “Kay did a great job replacing some of our bathroom floor tiles. She is very personable and professional.